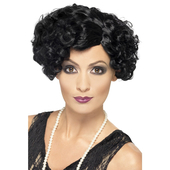 Coco Flapper costume features a black and pink fringed dress with brooch. Also included is a black cigarette holder, long pearl necklace and feathered headpiece with brooch. Feather boa and tights may be purchased separately. Very quick delivery. The costume is very comfortable and good quality. I am delighted with it.